I am 27 years old and currently work as an HR Manager at an advertising agency in Orange County. I grew up in Orange County, made my way to San Francisco for university and then to Los Angeles after I graduated. After a 3-year stint in LA, I moved to South Korea for 9 months to teach while travelling. I came back to LA after Korea and in 2015 I moved back home to the beautiful Orange County. Whenever I have time I’m with my friends or puppy, Shaquille (my boyfriend is a huge Lakers fan). My friends and I are usually eating, at Disneyland or eating at Disneyland. We love food and Disney. This is such a hard question. Probably Aimee Song (@songofstyle) or Irene Kim (@ireneisgood). Aimee’s wardrobe is so timeless and versatile, what I love is that she stays with the trends without losing her individual style or overdoing it. Her wardrobe is perfection. I’m obsessed with Irene Kim. She’s like the Kendall Jenner of Korea. She has such an edgy street style which she pulls off so effortlessly. I swear there isn’t a thing this girl can’t wear. I feel like a lot of my “edgier” outfit choices are inspired by Irene. I even had rainbow hair for a hot minute—of course inspired by her, it’s like her trademark look! If you like it, you can rock it. I go to Korea twice a year and I always come back with a new wardrobe. Seoul Street Fashion is a genre of its own. The girls in Korea put together outfits that look so cool and what’s crazy is that if I picked up the pieces separately at a store you’d think I was crazy trying to piece them together. But the girls in Korea do it anyways… They wear the clothes and don’t let the clothes wear them. I think all my trips to Seoul have given me the courage to be braver with my wardrobe. “Leave a little room for the unimaginable.” I am a very calendar oriented person. It’s good and bad. I’m the friend that sends out an iCal invite for dinner or vacations. I’ve come to learn that not everything fits into a schedule and that you need to leave a little room for the unexpected. I am lucky to have a tribe of such inspiring women who support each other in all our endeavours besides me. I “officially” launched my blog last August, but before that I’d do Instagram outfit posts. For years my girlfriends have been pushing me to blog and do beauty tutorials and finally I did it. A huge hesitation I had with starting a blog was that I’m not rich (if I’m being blunt). I didn’t think I could stand out against these other amazing bloggers who have Celine or Chanel in every other post. But when I started noticing my social media followers asking me where I got my bargain outfits, that’s when it clicked for me. I wanted to create a place for my followers to go and see exactly what I am wearing, where I got it and a direct link to buy. My iPhone, whatever lip color I’m wearing that day and probably a tie between my camera and a back up iPhone battery. I find inspiration all around me. Wether it be from other bloggers, runway models or the everyday girl I see at the mall. I try and find ways to recreate outfits I like at an affordable price. Fashion shouldn’t be something that only the wealthy can enjoy. 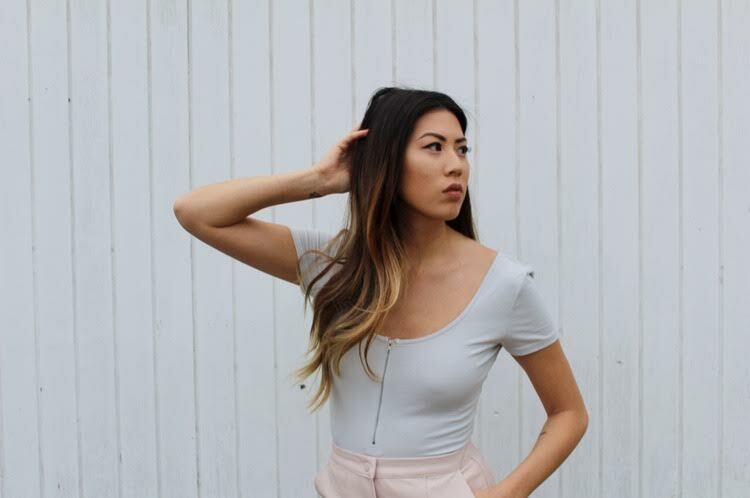 My best friend Amanda (www.feastfashionfaves.com) always tells me that it doesn’t matter that we can’t afford designer brands because we have individual style and know how to rock an outfit wether it be a $12 dress from Forever21 or a $500 dress from Bloomies. For me fashion is a way to express yourself… it’s your identity. You get to be creative in your outfit choices and how you style them. Fashion is a way for you to show the world who you. I’ve also found that fashion is something that connects us. I have been lucky to meet some great people through my blogging endeavours and something we all have in common is fashion. I wouldn’t call my blog great or unsuccessful but it is genuine. I see my blog as a passion project. It’s something I love to do and it helps me escape the stresses of my day-to-day. There are however unsuccessful blogs out there and in my opinion they are unsuccessful because they are doing it for the wrong reasons. Ever since the career of “blogger” or “influencer” erupted you see thousands and thousands of people trying to be a blogger because if you are successful you can make a boat load of money off it. I feel like when you do anything motivated by money, you don’t do it for the right reasons and that’s why you’re unsuccessful. What you’re putting out there isn’t genuine and you come off so transparent.